Bridget started at LifeCare Ambulance Service in 2001, working first as a paramedic and now in the dispatch center for the past six years. 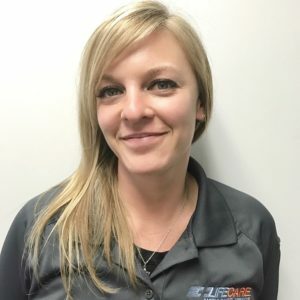 Bridget also received her Instructor/Coordinator license, and has been teaching the MFR/EMR course at Kalamazoo Valley Community College (KVCC) for the past three years. Bridget first discovered her interest in EMS while taking the Medical First Responder course as a prerequisite for her then chosen field of Physical Therapy. Bridget soon decided that EMS was her real interest and never looked back. Bridget went on to enroll in the EMT program and paramedic courses at Kellogg Community College. Bridget’s co-workers and supervisor nominated her for a Star of Life as a result of the extra efforts she has put forth in improving LifeCare Ambulance Service’s dispatch operations. Bridget recently created and implemented LifeCare’s new dispatch training manual as well as a new training and orientation program for the dispatch team. Part of this orientation includes a presentation Bridget put together for new field staff to see during their training. Bridget has also been hard at work improving employee recruitment and retention. Bridget is always willing to help others, and take the lead when needed. Bridget works diligently to make sure our patients are happy with the service they receive. This means going the extra mile to make sure we have the documentation needed to get a patient’s ambulance transfer covered, or working with the hospital and facility staff to get transfers scheduled. Bridget is always looking for ways to help and LifeCare is proud to nominate her for a Star of Life Award.